Vitals spoke with sound artists and composers Cat Hope and Jason Sweeney, about their extensive experimental music practices and their current works in development with Vitalstatisix. Cat Hope is a composer, sound artist, performer, songwriter and noise artist. She is a classically trained flautist, self-taught vocalist and experimental bassist. She is the director of Decibel new music ensemble, musical director for the Australian Bass Orchestra, and currently Professor of Music at Monash University, Melbourne, Australia where she is Head of Sir Zelman Cowen School of Music. She is developing her new opera Speechless with Vitalstatistix and Tura New Music, and will present showings of the work-in-development with us on 28 and 29 July. Jason Sweeney is interdisciplinary practice in the last 17 years has been in the emerging, risk-taking and constantly developing fields of digital art and technology, music, sound installation, performance art, interactive community art projects, online art, curation, experimental film and screen culture. As a composer of electronic music, he has also been releasing music internationally with two bands, Panoptique Electrical and Pretty Boy Crossover via the record label, Sensory Projects. His new work, Climate of Cruelty, has been commissioned by Vitalstatisix for Climate Century. Vitals: For those not familiar with experimental music and sound, and new music, can you each tell us a little bit about this field and its influences and communities in Australia? Jason Sweeney: To be honest, I came to this world of experimental music through playing in bands and the DIY culture of pop/punk. I imagine Cat will be able to give a really good potted history of this field better than I! I’m just lucky enough to be exposed to this rich culture of sound and music through different events and festivals, past and present, such as Liquid Architecture, What Is Music?, TURA and the incredible work that such artists as Gail Priest have been doing to collect and anthologise the Australian history of experimental music. Cat Hope: Australia has a wonderful and rich history of experimental sound and music practice that is acknowledged internationally. I have written about how important it is for a healthy cultural fabric here. Every state in Australia has a community of experimental practice, but how much the different strands – improvisation, sound art, new music – come together or stand apart depends very much on each state. Where I come from, Perth, they are intertwined making it a great place to make music focussed on sound. What kinds of platforms are there for your music and art, say in public, commercial, independent and/or academic worlds? CH: I found that experimental music isn’t really a commercially viable activity in Australia. It survives in funded, academic and community environments. It pops up every now and then in public forums – public art or large scale festivals. But it is difficult to get it reviewed or discussed outside academia. It’s a shame, because often, it’s really fun! Work by established experimental sound practitioners such as Amanda Stewart (voice), Jon Rose (all manner of violin) and Ross Bolleter (ruined piano) is very engaging and rewarding. JS: A great deal of my sound-based art works have existed online via net projects. It’s sort of how I began to get really interested in sound art. 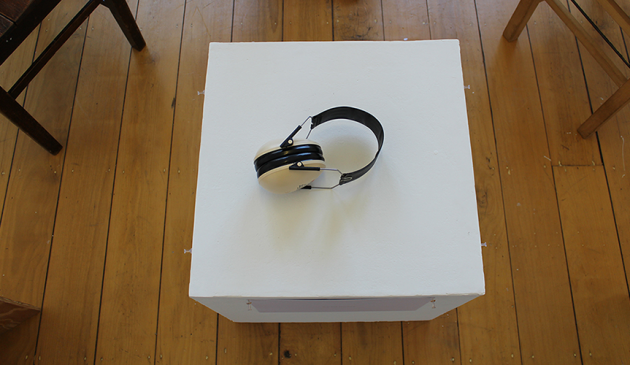 So there was an immediate portal to creating works that were audio driven, interactive and publicly accessible. But since those beginnings I’ve connected to different spaces and opportunities that are either by commissions or self-driven. Right now, a lot of my focus is on being a musician who plays gigs and releases music – it’s where it all began really. Somewhere along the way I got swept into the art world but I know that my real home is in music venues and in the ‘industry’ of bands and recording artists. And it’s a great challenge because since I first started playing in bands way back in 1991, so much has changed and labels are fewer and those that have remained are less able to take risks.What’s more, it’s an incredibly saturated world of new music, new bands, new recording artists – which is exciting but daunting for both maker and listener. But I’m swimming in that pool and hoping to come up for air soon. Cat, Speechless is a very ambitious new work and it is your first opera. Could you tell us a little bit about it? CH: I have always loved opera, but until recently could never imagine writing one. It just seemed too old and stuffy for me, even new ones I had seen. I’ve spent time living in Italy and that helped me to love the form and the way it can entangle everyday life. Then I began to think of the reasons opera was important to me – its large scale, its interrogation of important themes around the human condition, the formulae and it how it all works together. That helped me realise I could make an opera – one of my own, relevant to my time, my experience, the important themes of the current human condition of which I am a part. I needed a bit of courage and confidence that my own way of making music could make something meanings. I think it will be the first animated notation opera. Jason, you have a new collaboration called Winter Witches. Could you tell us about that? JS: Winter Witches is a live band and recording project that I do with my partner, Em König. We actually started using that name as a DJ duo but over the last 6 months have transitioned to focusing purely on song-writing, performing and being an active band on the live circuit. Our music is driven by the intimate collaboration between Em and I. He and I spend most of our spare time writing, rehearsing and developing new material at our home studio. We’re developing live sets all the time and we’ve got a bunch of gigs coming up this year. We’re also writing our debut album which is currently under the working title “Masc”. Jason, Winter Witches’ project Climate of Cruelty is addressing a huge issue, and one some find hard to talk about or accept – the human consumption of animals, and the cruelty and environmental destruction this causes. It may seem daunting to make an artwork about this – how are you approaching it? JS: Well, it’s certainly daunting. How do we commemorate and memorialise the animals that have died at the hands of humans in order to literally feed our insatiable desires? Both Em and I are passionate animal rights activists and practicing vegans so it’s sometimes hard for us to simmer down the heat on our fury when it comes to this subject – but doing it through music is actually a perfect way of communicating this often dark and despairing material. I suppose our task as musicians and song-writers is to keep a focus on the commemorative aspect of the work. We want to keep the work as open as possible to allow audiences to listen and to reflect upon this difficult subject. What we don’t want to do is just pour guilt upon our listeners but rather open up their ears, hearts, minds and eyes (through added visuals and the performative aspect of the work) to the present sadness – but also find potential hope that one day we as humans will realise we don’t need to partake in industrialised animal suffering in order to satiate our cravings. It’s also just a cold, hard fact that the livestock industries and factory farming practices are contributing far more to emissions and environmental destruction that any aspect of transport or other industries (the ‘popular’ culprits of climate change). So we’re finding ways to incorporate animal memorials set against some facts that may shock and surprise our audiences… hopefully into beginning a process of understanding and moving towards personal change. Cat, what has drawn you to make a work about children in detention? Why is the work wordless? CH: ‘Speechless’ is my response to people who have had their voice taken away. The work is not really about them, and I am not speaking for them, rather – I am trying to express my own response to some of the terrible things that are happening in Australia. I have felt so helpless in the face of them, this is my attempt to act in a personal way. ‘Speechless’ is a ‘noise opera’ that uses the report Gillian Trigg’s oversaw for the Human Rights Commission, ‘The Forgotten Children: National Inquiry into Children in detention’ as its basis. But the work responds to people who have lost or are challenging their ability to be heard in Australia more broadly – from women, to indigenous people, to refugees. I was keen to know how music – without words- speaks, in this specific instance. Through my own attempt to respond, can it offer others a way to respond too? Cat, this year you have moved from Perth to Melbourne to take up the position of Head of Sir Zelman Cowen School of Music – congratulations! You’ve been forging some new directions and initiatives at the School – can you tell us about this? CH: Yes! I have started by introducing quotas for the performance of music by Australian’s and women into the final year recitals of all performance students. I am striving to make Australian music– including the study of the complex, rich, mixed fabric that defines it now and in the past – a key to the school’s identity. Through this I hope to create graduates who engage with a music making that is linked to who we are, how we fit in the world, and enable greater equity of opportunity for all that take part in the making of Australian music. Jason, you have a body of work that addresses silence and quiet ecology. In the face of distressing global politics, increasing levels of anxiety, and social media addiction, what is the field of quiet ecology offering? JS: Essentially the field of quiet ecology is offering both a physical manifestation and a conceptual realisation of ‘quiet’ that in order to survive as a species we need to keep finding the balance between calm and chaos. It’s been a long-term project that has allowed me to engage with a global community of quiet seekers, a wide and diverse range of people who are invested in pursuing a better world through advances in ethical and smart architecture, explorations into acoustic ecology and sound preservation, silence/quiet as imperative requirements for introverts, and to help those with acute anxiety and the treating of mental illness. My hope is that this work has a low-volume resonance into the future and contributes to the ever-growing desire for a quieter world. Cat, this is the first time you have worked with Vitalstatistix; Jason you have worked with us many times! You will both be undertaking residencies with us as part of the development of your works, later this year. Residencies and labs are a big part of what we are offering artists this year. How are residencies valuable, and what are are you looking forward to about working with Vitals later in the year? CH: I have done a number of residencies during my career, and their value really depends on what else is happening in my life at that time. But the common factor they all offer, if you are open to it – is focused time. With my new position, this residency is so valuable – it gives me a block of time away to really focus on this project. I can’t imagine getting it completed without a residency opportunity. I am looking forward to being absorbed in making work with a great team of people for two whole weeks! JS: Residencies are so important for artists and projects. They allow a slow-burn approach to creativity, rather than just rushing out product. They allow collaborations to unfold and find their shared language. You can really start to understand who your creative family is through residencies. Both Em and I are looking forward to having dedicated time to work with Jennifer Greer Holmes, Geoff Cobham and Sebastian Tomczak and to really begin to build Climate of Cruelty into something beautiful, compelling and strange. What are you each listening to at the moment? CH: Well, you will be surprised to know – contemporary opera! This includes works by Anne Le Baron, Eryk Abecassis, Thomas Ades, Hermman Nitsch, Fausto Romitelli, Gerogy Ligeti and my usual rotation of obscure Ennio Morricone albums and songs by Low. Oh – and a revisiting an old favourite, Adriano Celentano’s Prisencolinensinainciusol. JS: My favourite albums at the moment are ‘Party’ by Aldous Harding from New Zealand and the new album by Venezuelan musician/producer, Arca. For me they are the best albums to be released this year. I’ve also just recently been introduced to the wonders of Ivo Dimchev who is an incredible queer musician and performance artist from Bulgaria. He’s all over Youtube. Some of his songs will break your heart.